Countless lovers of gospel music have enjoyed the original album. This new, completely remastered, version is a giant leap forward, in inspiration; a moving and powerful experience. 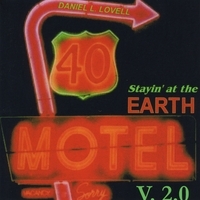 “Stayin’ at the Earth Motel V.2.0”, is the third album that I have posted on CDBaby.com. This new version contains the best songs from my first album, “Stayin’ at the Earth Motel”. But now, each of these songs has been completely remastered using the latest digital techniques. I have also enhanced the musical accompaniment to these songs for a richer, more powerful sound. My many critics agree that V.2.0 is a giant step forward, with a moving, and more powerful, listening experience than the original release. By the way, the first “Stayin’ at the Earth Motel” is still available on CDBaby, because it has some original songs not found anywhere else. My second album, “Rent’s Past Due at the Earth Motel”, with 12 more original songs, is also still available on CDBaby.com. My book of song lyrics, “I Met the Manager of the Earth Motel”, is now available in soft cover. It contains all of the lyrics from my 3 albums, plus the lyrics to many more of my, as yet, unpublished songs. Also, I have available, sheet music of full choral arrangements for two of my songs, “Morning Fields”, and, “Jesus is Alive”. Sheet music is also available for, “My Hearts Desire”, and other selected titles from my catalogue. Please contact me at dlovell@sutv.com for ordering. Please visit my web page at AmericanSongspace.com (search for Daniel Lovell) to hear more of my music and to view photos of my book and sheet music. As always, my special thanks to my lovely wife, Betty, for her love and constant support. And, thanks to Carter Green and Greenjeans Studios of Wellington, Kansas for his professional recording excellence.